Alaskans are keeping their eyes peeled for critters that flap, scurry or splash, but would like to know more about where to aim their gaze. "Seventy-eight percent of Alaskans want to know more about how and where to view wildlife," said Michelle Sydeman assistant director of the Alaska Department of Fish and Game Division of Wildlife Conservation in Juneau. In response, the U.S. Forest Service and Fish and Game have worked together to create Eyes on Wildlife, a program offering viewing tips and other information about Alaska wildlife. The program has developed a brochure and Web site as an informational resources for wildlife viewers. In the brochure, wildlife viewers can find a wildlife checklist they can use to keep track of the wildlife they have seen. "People can tack them to their refrigerators...it can be kind of a fun family activity," she said. Viewers who reach ben-chmarks of 25, 50, 75 or 100 species of animals spotted can go online and print out a certificate marking their achievements. But the brochure specifies that animals checked off the list must be alive, undomesticated and uncaged. "People love to challenge themselves and set goals," she said. "So we thought we could challenge visitors and residents to learn more about wildlife." But the Eyes on Wildlife program, is not just about ticking off animal species like collector cards. It also promotes learning more about the animals viewers are looking for. Viewing recommendations found on the Web site and brochure, for example, encourage viewers to learn about species' favorite habitats, tracks and feeding patterns to improve their chances of encountering them. "The more you know about something the more you appreciate and care about it," she said. She said learning to recognize animals is also a big part of enhancing a wildlife viewing experience. "There are hundreds and hundreds of species in Alaska and most of those species are not species that many people can identify," she said. Although Alaska residents and visitors quickly recognize many of the state's larger animal species such as caribou, moose and black bear, they are less likely to know what they are looking at when viewing smaller animal species, she said. The Eyes on Wildlife checklist challenges wild-life viewers to pursue not just the obvious animals, but also how to identify a limpet or how to distinguish a marten from a mink. Other tips offered in Eyes on Wildlife resources recommend looking for wildlife at dawn or dusk and looking for specific species according to season. Spring, for example, provides a great opportunity to catch sight of migratory bird species such as swans, loons and cranes. And come summer look to the sea and the rivers for salmon, seals and porpoises, the brochure recommends. But wildlife viewing is more than good recreation and good way to educate people about their environment. It's also good business. Visitors cite mountains, glaciers and wildlife viewing as primary reasons for traveling to Alaska and spend approximately $1.6 billion here a year. "People want to see the charismatic megafauna," said Dave Worrell, communication director for Alaska Travel Industry Association. "There are opportunities to see wildlife in Alaska that are unparalleled." Eyes on Wildlife bro-chures are being distributed to visitor centers, schools and business that provide services to visitors. 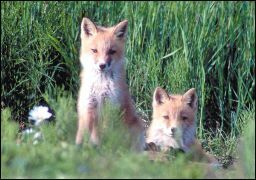 Information on the Eyes on Wildlife program can be found at www.wildlife.alaska.-gov/index.cfm?adfg=viewing.main.